The Hostal Patria is located right in the heart of Madrid, in the Puerta del Sol, easily accessible on foot, by bus or taxi. We are surrounded by shops, restaurants, museums, theatres and other places of interest. Our address is Calle Mayor, 10, between the Puerta del Sol and the Plaza Mayor. The area around the hostel is easy to explore on foot and takes just a short while to get to know. We are also extremely easy to reach by public transport, since the Sol Metro and Train station are just 50 m. away, and the Atocha, train station is only 1 km. away. The Callao, Ópera and Sevilla Metro stations are also within easy walking distance. 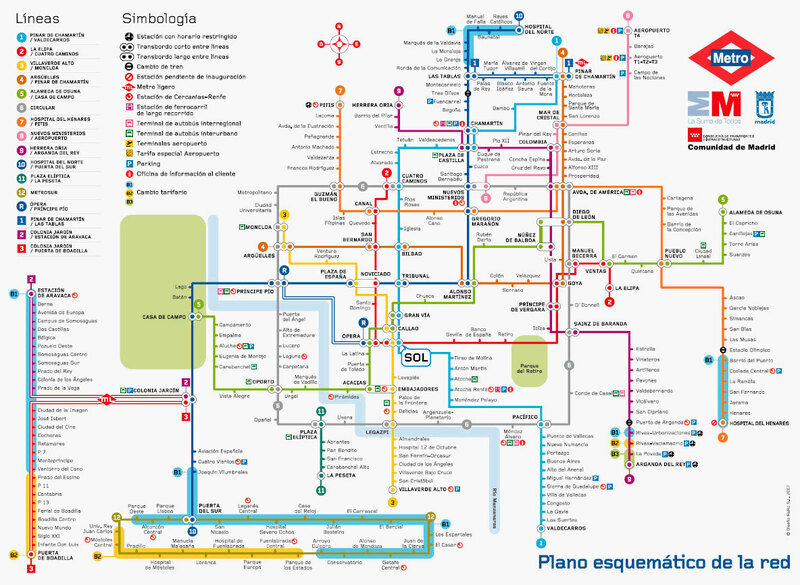 Consult the Metro (underground) and Renfe (train) maps below for information about getting around Madrid with the public transport available near the hostel. Another possibility is to see the city by bus. Numerous bus lines cross the city centre very close to the Hostal Patria. 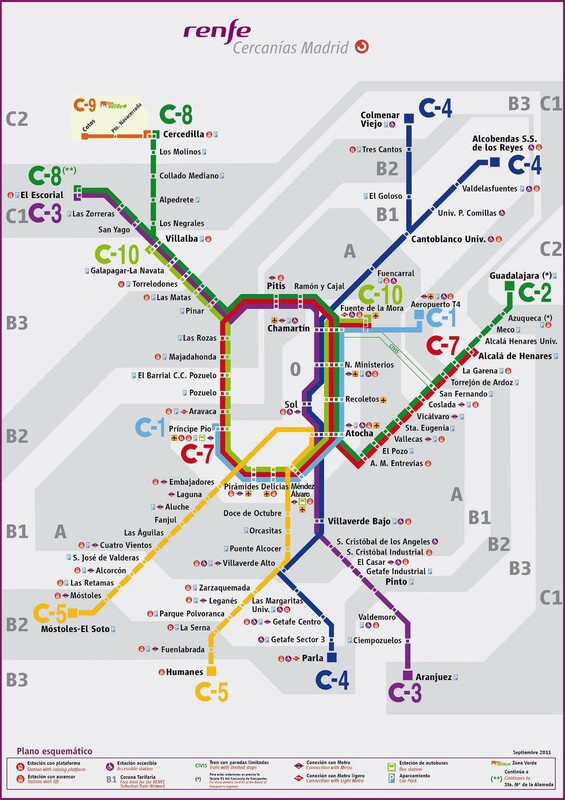 Consult the EMT (municipal bus system) website to find out more about bus routes and choose the itineraries that most interest you during your stay in Madrid. MetroTo get to the Hostal Patria from the airport by Metro, take Line 8 to Mar de Cristal. Change there for Line 4 and get off at Goya. Change for Line 2 and take it to Sol. When you arrive at the station, take the exit for the Calle Mayor. DuraciónTravel time: approximately 50 minutes. PrecioEstimated cost: 5,00 €, including the 3€ airport surcharge. A pieFrom the Puerta del Sol, walk up the Calle Mayor until you reach nº 10. The Hostal Patria is on the 4th floor. The parking lots closest to the hostel are located at: Plaza de Jacinto Benavente, Plaza Mayor and Plaza del Carmen. Take Metro Line 8 (the pink line) from the airport terminal to Nuevos Ministerios. You can change for a local train there (Renfe). Follow the signs with a C.
Renfe: at Nuevos Ministerios take either line C3 or C4 to Sol (only one stop). These trains usually use Platform 8. Estimated travel time: approximately 40 min. Take the local train (Line C1) from Terminal 4 to Chamartín. Change there for either the C4A, C4B or C3 lines which will take you to Sol. From there it is a very short walk to Calle Mayor, 10, where the Hostal Patria is located. Estimated travel time: approximately 30 min. Take line 8 to the Mar de Cristal station. Change there for Line 4 to Goya, and change there for Line 2 to Sol. Take the Calle Mayor exit. Estimated travel time: approximately 50 min. Estimated travel time: approximately 35 min. Taxis to and from the airport have a fixed rate of 30€, including luggage. The stop closest to the Hostal Patria is Plaza de Cibeles. From there you can either take the Metro, Line 2, to Sol. Another option, if you don´t have much luggage, is to walk from Cibeles to the Hostal (approximately 15 minutes). The Airport Express Bus runs 24 hours a day. From 6:00 a.m. to 11:30 p.m. it runs every 15 minutes. From 11:30 p.m. to 6:00 a.m., every 35 minutes.